Massage for detoxing your body the natural way without changing your diet. The key to better detox is in your lymphatic system. Lymph detox. There are many benefits of massaging your lymph nodes promoting better circulation in your lymphatic system in detox as well as weight loss. Getting a lymphatic massage helps flush toxins from your body through your lymph system (detox) in addition to aiding in fatigue recovery after strenuous exercise (weight loss). What often comes to mind when talking about detox is detoxing your body drinking water and eating right, taking a hanshinyoku bath, sitting in the sauna, or getting a deep tissue massage. Here we are going to be discussing lymph detox. 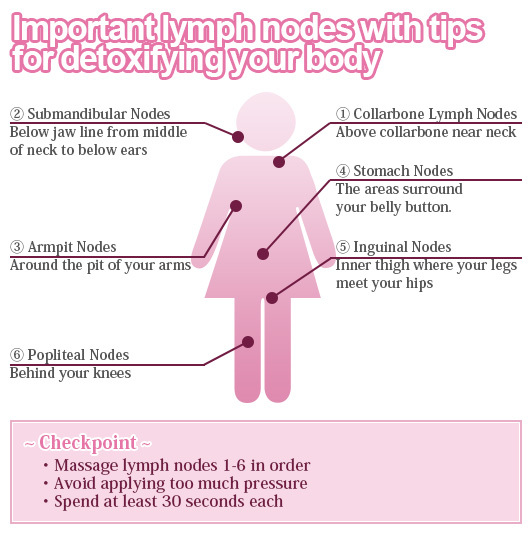 Lymph detox is a detoxification method that applies massaging techniques on various lymph nodes throughout your body to help flush harmful toxin out of your body. Poor lymph circulation may cause unwanted water retention! Unlike blood circulation that has less of a tendency to slow down and get bottled up pumped through your blood circulation system by your heart, the lymphatic system doesn't come with a pump. Lymph flow gets bottled up in parts of your body most notably you lower and upper extremities which means your legs. Edema leg swelling making your legs appear bigger than they really are is thought to be caused by poor lymph circulation. If you work at a desk and find yourself stuck in one particular position throughout the day sitting, then checking into you lymph circulation system is highly recommended. Bottled lymph flow has the effect of making you look fat. Ever have a bloated face first thing in the morning? Well, it may be time to massage your submandibulars to fix face bloatedness. Slowly apply pressure on the lymph nodes around your collarbone holding for 3 seconds. Then, release pressure from. Repeat several times. Relieve stiff neck and shoulder pain. Starting from the middle of your neck working your way towards your ears carve a path tracing the area below you jaw line sliding you fingers upward. Get rid of a double chin and a bloated face slimming down your face. Start from your wrist to your elbows and work your way from your elbows to your armpits stroking the inside of your arms as you slowly move upwards. Good for flabby upper arms and relieve fatigue in your hands and arms. Gently rub the area surrounding your belly button with your fingers. Fix constipation and recover from menstrual irregularities. Lose lower back flab. Massage your body starting around your waist working you way to the area where your legs join your hips on the inside of your upper thigh region. Slim down you lower body and get rid of cellulite. Start by massaging your knee moving around towards the back of your knee. Start from the back of your ankles near your Achilles tendon massaging your legs towards the back of your knee using both hands to apply pressure. Now that you've finished up your lymph detox massage, you are probably wondering where to next? - Fortunately enough, there are all kinds of lymph massages out there including a lymph drainage massage designed specifically to slim your face. Say goodbye to a bloated face in the morning, give it a try!